Next up in our PA Anatomy are the front fills. Fill speakers, in general, are often misunderstood. There is a tendency for the uneducated/non-professional to think that because they see a speaker in front of them, it should be blaring in an obvious fashion with all the frequencies of the mix. But that’s not the point of a fill speaker. A fill speaker is there to “fill-in” sections of the listening area that do not get full coverage from the main loudspeakers. 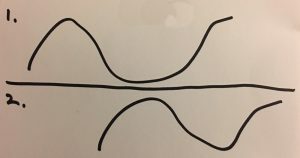 So let’s look at this using the front fill as an example. 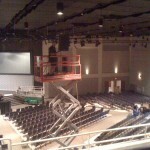 When speakers are flown, it is often difficult to cover the front portions of the listening area with the main loudspeaker system. 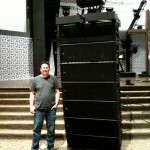 Typically I want my main loudspeakers covering the largest amount of audience as possible, and in doing so they often get aimed so that the full coverage of the speakers might start a few rows back. In order to give those front rows the same experience as the rest of the audience, we use a front fill speaker to fill in the coverage gap. Depending on the coverage pattern of the loudspeakers, this might mean simply adding some sizzle to fill in missing high frequencies or it might even mean running them down lower to fill in more of the spectrum. Our new system will feature 10 Meyer Sound M1D’s for front fills. It basically works out to one front fill per sub. 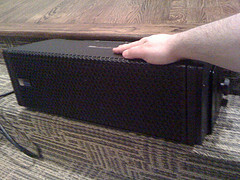 I put my hand on the speaker when I took the photo to help give a sense of the scale of the speakers as they’re not very big. Our front fills serve a few standard fill purposes. For starters, they’ll fill in coverage that is missing from the main loudspeakers. Secondly our front fills will help keep things balanced right in front where the sub coverage is a little hotter to keep everything feeling even. Our front fills will also serve an important imaging task for the first couple rows. They’ll help pull the image down from the main loudspeakers so the folks sitting in front feel like the sound is coming from the stage and not from over their heads. Humans tend to have a difficult time localizing sound in the vertical plane, however, when you have a speaker almost directly above your head, it’s hard not to perceive the sound as coming from above. 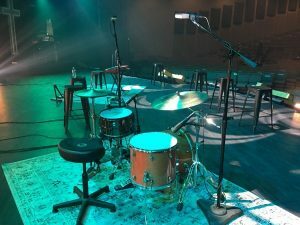 We added some M1D’s for front fills when we did the CD recording last fall, and I distinctly remember they sounded great. I have a feeling that the first couple rows might really be some of the best seats in the house. Next in PA anatomy, we’ll visit the balcony where the seats, in my opinion, are the most comfortable in the room.